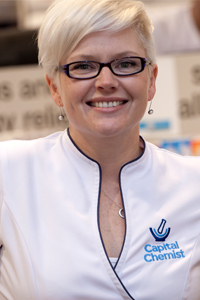 It seems 2014 has been a big year for pharmacist Samantha Kourtis, Managing Partner at Capital Chemist Charnwood. In March, her pharmacy was awarded Pharmacy Guild of Australia's Pharmacy of the Year before Samantha was recognised as Telstra ACT Business Woman of the Year in October. A firm believer that pharmacists need to step out of the dispensary to engage with customers, Samantha has established a national model for community pharmacies extending their services beyond traditional roles. Her long-held interest in wound management and identification of local healthcare service needs led Samantha to introduce a medical compression garment clinic within the pharmacy that she has managed since 2013, improving the health outcomes for more than 550 patients with circulation problems and diabetes. Graduating with a Bachelor of Pharmacy from CSU in 2004, Samantha says her passion for community and healthcare drives her desire to make a real difference to the lives of others. At university I was inspired… to become a community pharmacist who became an integral part of and made a difference to the health outcomes of my community. Today I'm motivated… by my three beautiful children, my team at the pharmacy and my community. In my profession it is important to… engage with your stakeholders – customers AND other health care professionals. The biggest influence in my life... my grandparents. My grandparents got me my first job in pharmacy when I was 14 as my grandfather was the pharmacy owner's solicitor! They said to me "it's not what you know in life but who you know" - while I acknowledge that hard work and determination take you places, the relationships you make with people along the way is what really makes a difference. My grandparents instilled a great many old fashioned virtues in me that I find myself using every day in the pharmacy. My job isn't just about making money - as community pharmacists we are sometimes not only the first point of contact in a crisis but often the only person left to turn to for help. Treating each and every patient with respect and patience is essential. My greatest achievement is... winning Pharmacy of the Year one year into ownership of the business. I'm most proud of… my ACT Telstra Business Woman of the Year Award, which has come during an exciting time in my career. Backing onto winning Pharmacy of the Year, it's forced me to step to the side from my pharmacy and focus on my business skills and mentoring. This has, in turn, made my team stronger and they see more opportunities to develop their career in our industry. I am extremely proud to be representing community pharmacy and am hoping that I will be able to inspire more women in healthcare to step into ownership and leadership roles. While more than 70% of our pharmacist workforce is female, less than 30% are business owners and less than 20% hold leadership roles at the Pharmaceutical Society of Australia and Guild. It's exciting to own a business that is kicking goals as a result of my business strategies, especially in the face of PBS reforms. More exciting is that the Telstra award recognised my commitment to my community and profession in making a difference to health outcomes. It is possible to be a successful business owner and deliver ethical and viable healthcare.